There’s no doubt about it, living in the tropics is amazing and the island country of Grenada is no exception. The heat, the sand and the sea are all definite perks, but even though there are so many pros to living in a warm, humid climate, there are definitely some cons! Because the climate is somewhat damp (for part of the year anyways), items in the home can become mouldy. Sheets and pillows on the bed start giving off a musty smell if not changed frequently enough, and mould starts to creep up the walls in the bathroom – even though we’re only having cold showers! The worst part is that our clothes have even become mouldy. We’ve tried hanging them up, and folding them away, but nothing seems to work. It feels like we’re doing laundry just to get musky smell out of our clothes. 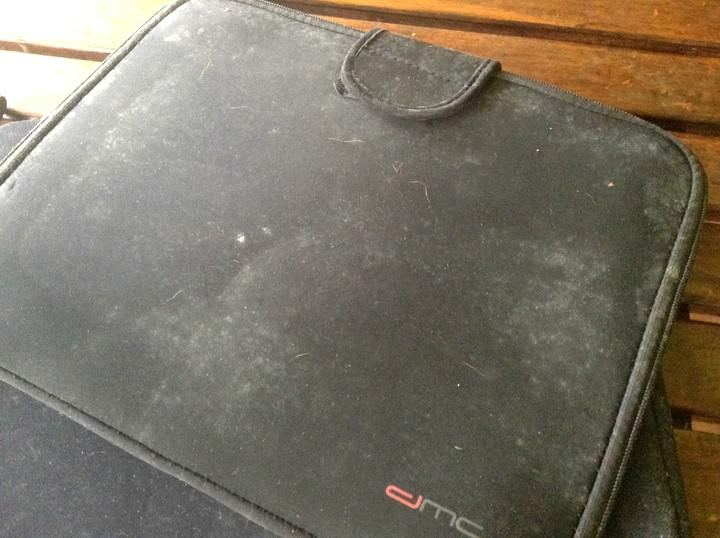 I even found fungi growing on our laptop covers. We constantly have our windows open to let in the fresh air, but it seems like during the wet season, there’s no stopping it. If you’re going to live in the tropics, creepy creatures are totally unavoidable! However, I have to admit, Grenada is pretty good when it comes to bugs and creepy crawlies. We don’t see spiders, scorpions or snakes, but we do have massive centipedes. Being from North America, we’re used to seeing the occasional centipede, which average about an inch in length. The ones we’ve been seeing here can be up to 12 inches long and they eat rodents! Their bite is filled with toxic venom, and although not fatal to humans, it can cause swelling, nausea, chills and fever. In total we’ve seen 6 inside our house, with one being about 10 inches long (I know this because it spanned the diameter of the cooking pot we found it in!) 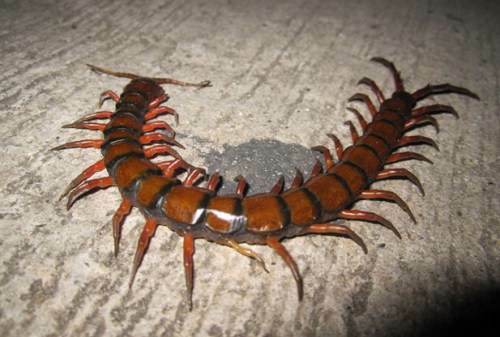 Just thinking about these huge centipedes makes me shiver. A huge centipede – eek! Having the option of swimming in either the Atlantic Ocean or the Caribbean Sea each day is a highlight of living here in Grenada. However, living near salt water wreaks havoc on electronic items. Since we work online, you can imagine how careful we are with our computers. Nick’s charging cord has completely deteriorated from the salty moisture in the air, plus we’ve gone through a couple of power bar cords, two toasters and two standing fans. We constantly clean our computers to get the salt off and do our best to take care of all the electronics in our house. The main concern with living in most tropical countries is the risk of Dengue Fever and Malaria – both of which are mosquito borne illnesses. Here in Grenada, dengue fever is present, but malaria is not. There’s no vaccine for dengue, so the best we can do is wear mosquito repellent, sleep under a net and wear long clothes at dawn and dusk. Mother Nature can strike anywhere and at anytime. No matter where you go in the tropics, there’s always going to be the chance of a typhoon, earthquake, volcano eruption, tornado, hurricane, monsoon, tsunami or flood. Here in Grenada, the hurricane season runs from June to November and although there’s little chance of one happening here, there was a major category 5 hurricane (Ivan) back in 2004. We always check the hurricane and storm websites to stay up to date. All looks well in the Caribbean at the moment! 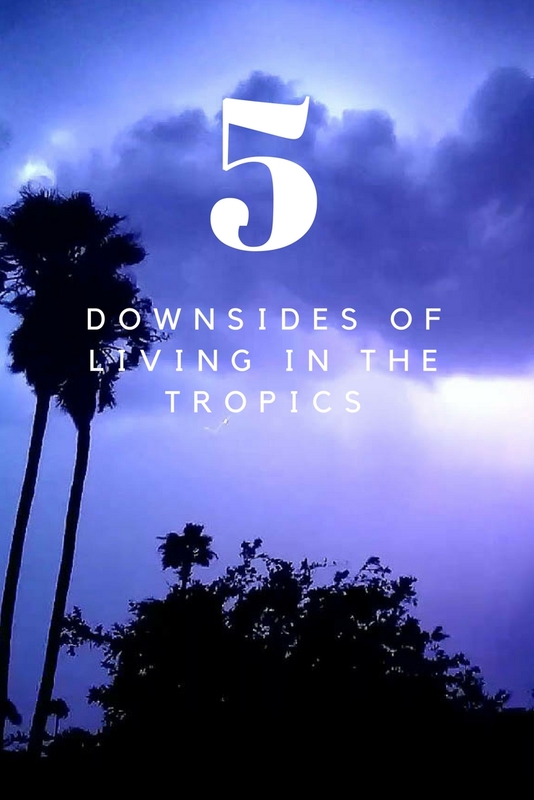 I struggled to come up with these 5 downsides of living in the tropics. And honestly, the chances of disease or natural disaster are small, we’re mostly concerned about the salt ruining our electronics! The upsides of living in a tropical paradise far outweigh these downsides…stay tuned for that list. Would these downsides deter you from living in the tropics? Oh man, I can relate to this: monsoon in Goa is frustrating. The mold on my shoes, the closets smelling, getting dengue, and 8 foot long pythons in my garden. #notcool . A/C is the only thing keeping monsoon from ruining our house and clothing. 4 months of rain in houses like these- A/C is the one thing that keeps things a litle fresh (maybe it dries stuff out?) Another thing that helps with the smell is putting essential oils (i love lavender) in your bag & closet. Also, I find that putting a thin layer of coconut hair oil on my leathers for those months really keeps the mold away. At the end of rainy season I wash everything and put it out to dry and it’s good as new! Ah yes…..I remember these well. Mould? Check. Ruined a few items this way. Dengue? Check. Had it twice, including a particularly rough case within a week of my arriving in Grenada. Salt? I never took my electronics outside as a preventative. Um, a foot long in Spare’s bowl!!! I would lose it 🙂 There’s just something so gross about centipedes, can’t stand them. Seems like you’ve had some exciting times in the tropics! They’re definitely hard to deal with! Funny when we think of the tropics we think of palm trees and beautiful scenery but never think of all the other things. We just spent 5 months on Maui and have experienced everything on this list except for disease. There are no tropical diseases here other than rat lungworm, as far as I know. Those centipedes look scsdy and the mosquito diseases , o no!! I toally love the Caribbean but I know what you mean about the mouldy and musty smell. Comes with the paradise and would not deter me. Are you both staying in Grenada for a while or moving to another island? I agree, wouldn’t deter us from travelling anywhere 🙂 We went to SVG for 3 weeks in July, but are just in Grenada now until November. Love it here. I <3 living in the tropics! None of this really bothers me at all actually… there's always a negative to be found, regardless where you live! A/C definitely helps with keeping the musty mould smell away, plus the mould.I am in China teaching at the moment, when I arrived at my apartment,the first night was awlful.I could smell musty bedding, and couldn’t wait until I could wash everything and change everything and let everything air. It was 11.00pm when I arrived.It was an awlful night for me. Things are better now with 3 lots of bedding/sheets,doona covers that I can change when necessary. I also bought a washing machine as the expectation here is that I will wash the sheets/doona covers by hand. No way!! Never done them in my life, not going to start now. Also while teaching in Vietnam, had to put up with small geckos coming into my room,they are harmless, but I didn’t like them looking at me with their beady little eyes. YUK! They live off insects mainly mozzies, so very useful for that. In the end, I stopped worrying about them, and learnt to live with them. Atleast they are more manageable than 8 foot long pythons. Certainly am not going to Goa after reading that. YUK, YUK!! I love geckos! I’d be happy to have them all over my house just so they would eat all the mozzies 🙂 Where in China are you teaching? We were in Yangzhou, Jiangsu for a year and loved it. You’re lucky to have a/c to keep the mould away! That’s a scary looking centipede. We’re off to Thailand and Spanky already nervous about the bugs we’ll encounter. Yikes, and 8 foot long pythons! One other thing: sand. Sand that gets on your shoes, sticks to your feet, clothes, hairy legs..then you bring it into the house and no matter how much you shower you always manage to have some gritty salt/sand on the couch or bed. Drives me crazy! Great article! Living in Costa Rica I can definitely relate. Some aren’t quite sure what to expect and some find out it is not quite for them…. For me those pros outweigh the cons and it sounds the same with you. Agreed! Pros far outweigh any bugs or mould 🙂 Costa Rica is somewhere we’re dying to visit, hopefully in 2015! mold on everything? Even if you live in like an air conditioned house/apartment? No. If you have A/C, you’re fine! mold even in an air conditioned house/apartment? I live in the tropics and hate it, can’t wait to move to a temperate climate.